Malta boasts more than 280 days of sunshine in the year and Bugibba is an ideal choice for sun and sea worshipers. Low cost airlines have established direct routes from most of the major airports in Europe allowing for easy access to your own piece of the Med! 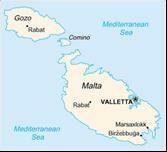 · A European Union member since 2004, Malta is an independent republic that enjoys political stability. · A Mediterranean climate that is moderated comfortably by mild winter temperatures. · Local people who make it easy to integrate with the local community. · Low levels of crime make Malta one of the safest places in the region. · English is one of the two official languages of the islands and is spoken by everyone. · Malta boasts a high standard of hospital and medical services, both private and public. · Quality schooling that often exceeds international standards with a choice of English-speaking schools and a university. · Excellent digital telecommunications network. · Relatively low cost of living compared to other European countries. · Easy access to major European capitals. · A stable property market that offers a wide variety of property in all price ranges, and good prospects for capital growth. The residency conditions are attractive, too. They include a favourable tax regime and the absence of rates or council taxes. So these benefits, together with an abundance of historical and cultural attractions, crystal clear seas, a variety of sporting facilities (including world class diving) and a lively calendar of events, make these islands, generally, and Carolina Apartments, specifically, the very centre of Mediterranean life.